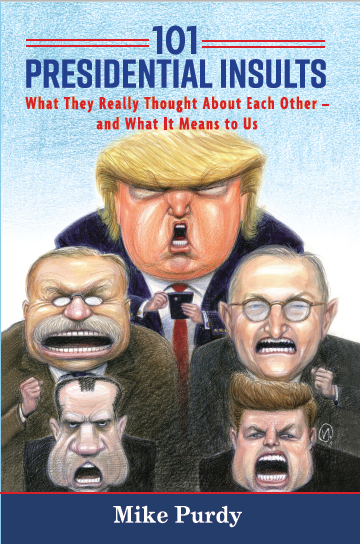 I’m excited to announce the publication of my new book about our presidents – how they’ve historically insulted one another – and what this lack of civility means to us in our current political environment. 101 Presidential Insults: What They Really Thought About Each Other – and What It Means to Us peeks behind the political curtain – exposing that our presidents have dished out acerbic insults about other presidents from the founding fathers to the age of Trump. Meticulously researched, the book is a significant contribution to our understanding of the character of the 44 characters who have served as president. In it, I challenge us and our leaders, despite our sordid history, to rise to “the better angels of our nature” and reject the acidic politics of personal demonization. 101 Presidential Insults is a quick and fun read, shocking at times, sobering, and thought-provoking. It is a must read for anyone interested in history and concerned about the current lack of civility in politics. See the book cover at the end of this email. Can you help? I be grateful if you’d help get the word out about the book. Buy the book now by pre-ordering it from Amazon using this link: https://www.amazon.com/101-Presidential-Insults-Really-Thought/dp/1543963749. Or you can pre-order it now from Barnes and Noble using this link: https://www.barnesandnoble.com/w/books/1131107109. Any bookstore can order the book as well for you as it will be available through the main distributors that bookstores use to buy their books. The book will be released on June 7, 2019. The more pre-orders for the book, the more Amazon and Barnes and Noble will promote the book. Forward this blog post/email to your family, friends, colleagues, co-workers, acquaintances, and others who may be interested in it. Share information about the book (a link to the Amazon or Barnes and Noble addresses noted above or other information) on Facebook, Twitter, Linkedin, Instagram, and other social media platforms. Write a review of the book after you receive it and post it to Amazon by June 25. The more reviews the book has early on, the more Amazon will promote the book. Your review doesn’t have to be long. Just some quick and positive thoughts about the book. Speaking: I’d be grateful if you would pass my name on to people if you know of opportunities to speak to a group or organization with which you are associated. Private and Public Insults: Sometimes in private letters, diaries, and conversations, they let their guard down on what they really thought about a former, deceased, current, or future president. At other times, these insults have been audaciously proclaimed in public speeches, books, and to the media. By their own words, our presidents have demonstrated their flawed humanity with insults that are often humorous and sometimes shocking for their lack of decorum. We may laugh or perhaps wince as we read these 101 presidential insults. A thoughtful and challenging introduction calling for increased civility in our private lives and the public square. 101 humorous, shocking, and sobering quotes by the presidents about other presidents that includes a brief description of the occasion, source (letter, diary, speech, etc. ), and date for each insult. There is at least one quotation about each president, demonstrating that such behavior has been around since the nation’s founding and occurs regardless of political party affiliation. Three lists (alphabetical by insult, about/by list, and numerical analysis by source of insults) help the reader to view these caustic comments from different angles. End notes citing primary sources for the quotes (when known), or reliable secondary sources that reference primary sources. The end notes are a significant contribution to documenting these quotes. I chose not to include some quotes that I could not track down. 2020 Challenges: The upcoming presidential election will be a test of our national character and the character of the candidates. Ultimately, our survival as a nation depends on our ability to treat others with respect, and to promote civility, consensus, and compromise. I hope you pre-order the book today and enjoy it! Thanks! !